The sizes, areas of application and use of steam generators in industry are diverse. Boilers with a capacity of several 100 t/h are used in power plants. Medium-sized plants use steam for heating in production. The mostly smaller steam boilers (< 500 kg/h) are used in spas, baths and saunas. Or used as air humidifier for instance in the paper and tobacco industry. These machines operate at very high pressures and temperatures (150°C and higher). To reach these temperatures, large amounts of energy are required. The water is chemically conditioned so that no deposits form in the steam boilers. Despite all chemical treatment, coatings inside boilers cannot always be prevented. 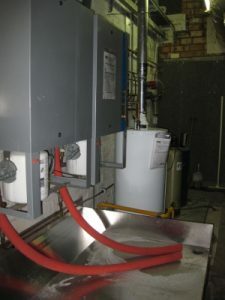 Deposits in the boiler have an insulating effect. This means that the energy required to heat the water increases. Corrosion is also an issue time and again. Of course, the power generation companies take great care to only use water of the highest quality. In order to prevent possible problems in production. For small boilers, if the steam is only used for humidification or in a sauna, the same amount of water treatment as in a 1000+ MW power plant cannot of course be used. Therefore, in the case of a smaller steam generator for a steam bath, with reasonably good water quality, chemical treatment is sometimes dispensed with. What does the Merus Ring do in the steam boiler? 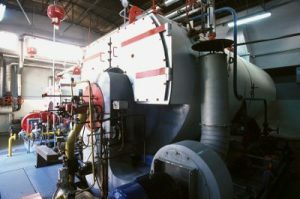 Merus can be used in a steam generator in two ways. As a rule, a Merus ring in the supply line is sufficient. On the one hand, this reduces or completely stops corrosion. This can be easily measured by the iron content in the blowdown or desludging. The course of the iron content is always similar after installation in the feed water pipe from the steam generator. First, the iron content in the blowdown water increases when the internal corrosion is reduced. This then becomes less and less and usually stabilizes after only a few weeks to a value close to the iron content of the boiler feed water. If classical water treatment has to be dispensed with for cost reasons, it is assumed that the steam generator has to be cleaned regularly. Merus rings are used on such steam generators to reduce or prevent limescale deposits. For feed water with less than 1,000 TDS, customers achieve very good results. Systems can also be cleaned without chemical water treatment, only during the course of regular maintenance. If the Merus Ring is used as a supplement to chemical water treatment on the steam generator, considerable savings can be made on the chemicals required. Corrosion can thus be avoided or stopped. After installation of the Merus ring, the deposits are reduced to a minimum on models with automatic desludging device. When the water is drained, the lime is simply washed out as well. For older models, the water must be drained manually. In this case, however, service times are significantly reduced and any lime still present has a soft consistency and can be rinsed off without any effort. Attention: We expressly point out at this point that if Merus rings are used on a steam boiler, the customer must ensure that the steam boiler is continuously monitored with suitable methods and that its effectiveness is checked! For example, by increasing the amount of water replaced during bleed off or by doing more often the bleed off / blow down. In addition, if you use Merus as the only water treatment system on a steam boiler, please consult the local supervisory authorities, for guidance and approval.